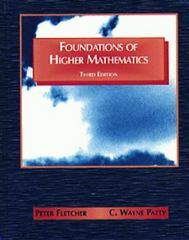 Foundations of Higher Mathematics 3 Edition This text introduces students to basic techniques of writing proofs and acquaints them with some fundamental ideas. The authors assume that students using this text have already taken courses in which they developed the skill of using results and arguments that others have conceived. This text picks up where the others left off -- it develops the students' ability to think mathematically and to distinguish mathematical thinking from wishful thinking.